Alia Bhatt is currently the blue-eyed-girl of Bollywood. After back to back successes with performances such as that of Raazi, the actress recently swept all mainstream awards for her superlative act. Now, gracing the cover of Grazia magazine for the month of April, Alia is making us fall in love with her as she dons a gorgeous Sari on it. Celebrating their 11th-anniversary issue, the cover calls her 'Limitless' and we completely agree with it. Alia has been unstoppable and is continuing to put up brave performances one after another. Alia has a big release next month with Kalank and we can't wait to watch her in it. 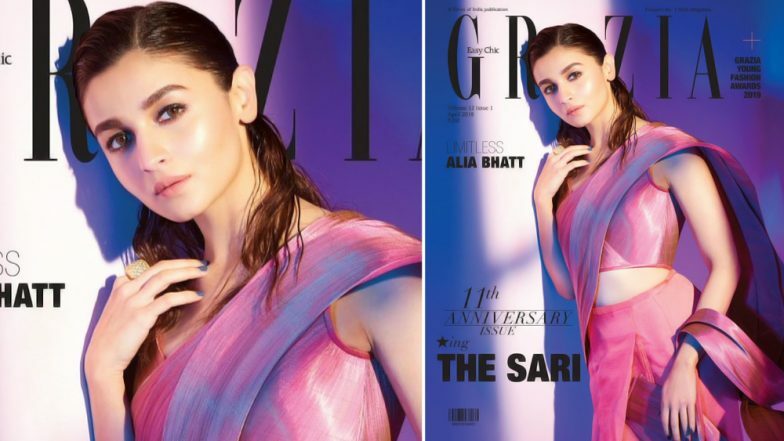 Not many magazines go for sarees for their cover girls and it was a delight to see Alia embrace the traditional look in a non-traditional way with a stylized drape. Sans any jewellery on her, the actress is looking elegant. We also particularly loved her pulled back hairdo with a side parting. The magazine's Instagram handle names Alia as India's favourite millennial. Ranbir Kapoor 'Grabs' Alia Bhatt For a Kiss at a Public Event, Video Goes Viral! Apart from Kalank, Alia also has another big release with beau Ranbir Kapoor. Ayan Mukerji's Brahmastra also stars Amitabh Bachchan and the film is all set to hit screens over Christmas this year.